Phoenix Law Enforcement Association > PLEA News > Officer Phil Akins is Phoenix’s Latest TOP COP! Officer Phil Akins is Phoenix’s Latest TOP COP! On March 11, 2015, Phoenix Police Officer Phil Akins responded to the area of North 16th Street and East Van Buren Street reference a fight between a male and female. Upon his arrival, he was immediately confronted by the suspect, who eventually stabbed the female victim, before attacking officer Akins. Officer Akins was stabbed in the chest and ended up shooting the suspect, who despite his injury, continued to fight with responding officers. He was was eventually taken into custody after a Taser was deployed. It was later determined the suspect had committed a homicide the night before this incident, which was unbeknownst to Officer Akins at the time. The 23rd Annual Top Cops Awards, held in Washington, DC on May 14, 2016 honored officers from around the nation for demonstrated acts of valor and heroism. Officer Akins was among those honored . PLEA along with the National Association of Police Organizations (NAPO) salutes Officer Akins as one of the nation’s 10 Top Cops for 2016. 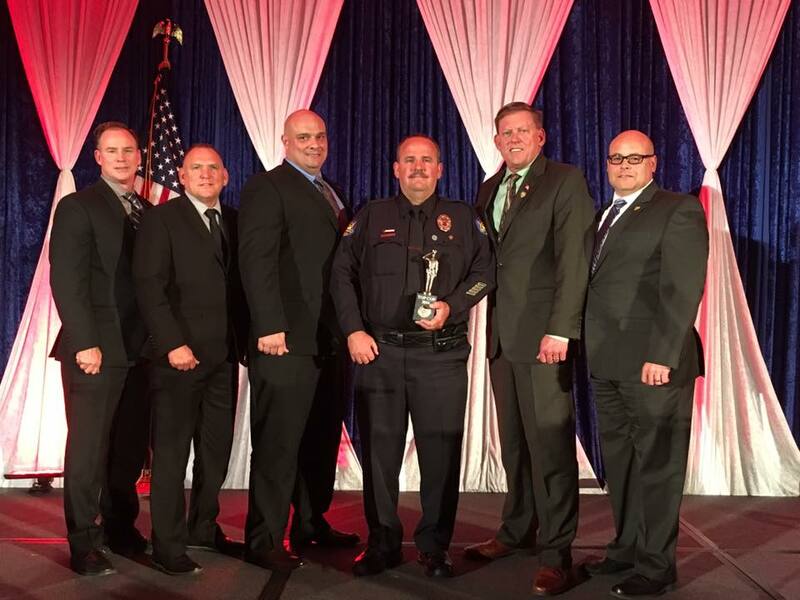 Pictured from left to right are Phoenix Police Chief Joe Yahner, PLEA Trustees Toby Sexton and Tim Baiardi, Officer Akins, PLEA President Ken Crane, and PLEA Trustee Mike London.